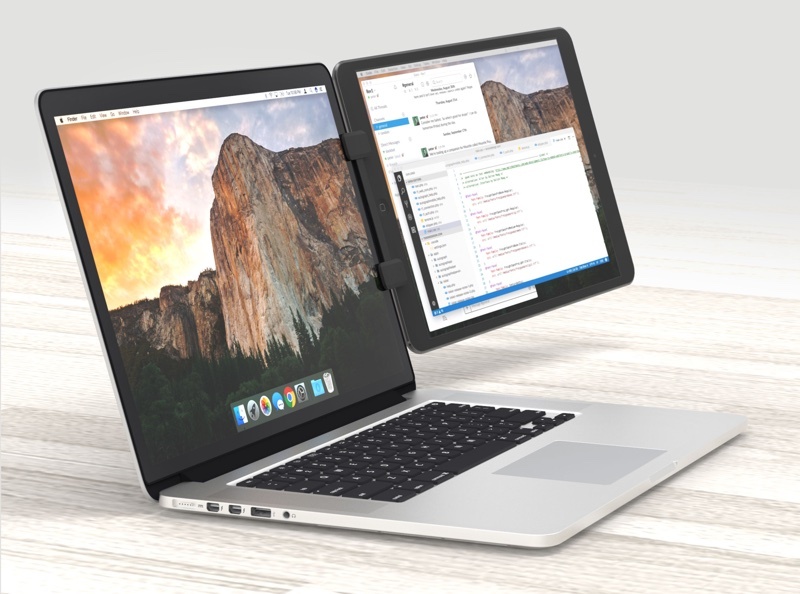 Ten One Design is today introducing the Mountie+, a new version of its popular Mountie device that allows an iPad or iPhone to be attached to the display of a Mac laptop for use as a second screen. The Mountie+ mount for the iPad has been designed with larger devices in mind. 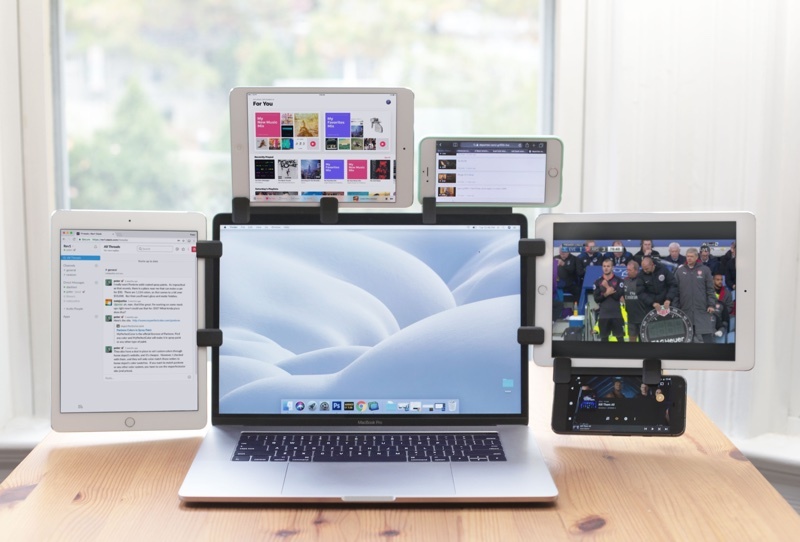 Mountie+ uses a two-clip system to attach an iPhone or iPad to a MacBook, and it works with all iPad Pro, iPad Air, and iPad mini tablets. It's also compatible with all MacBooks and "every other laptop," according to Ten One Design. The standard Mountie, which is also still available, works well with smaller tablets and the iPhone. Mountie+ also incorporates a new feature that allows an iPad to be charged while it's attached to a MacBook, by tucking the iPad's charging cable around the back where it can then be plugged in to an adapter. 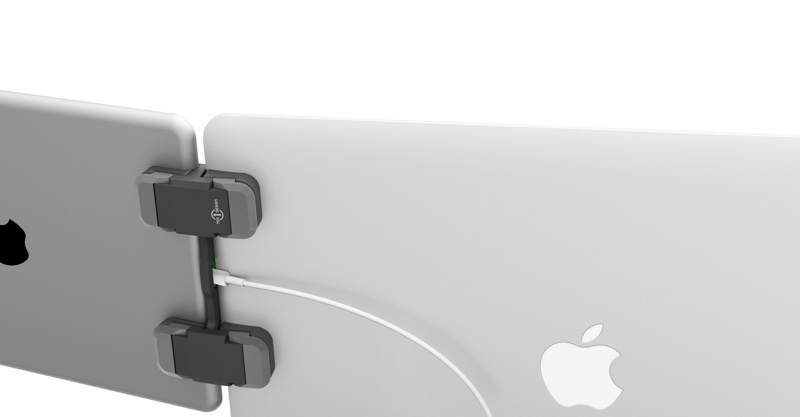 It's designed to make it quick and easy to snap an iPad on and off of the MacBook. When attached to a MacBook via Mountie+, there's only 4mm of space between the iPad and the MacBook screen, making it easy to see both displays at once. Mountie+ lets the iPad be mounted in either landscape or portrait mode. "Remote working and co-working is growing; we can see that trend as our customers look to use their iPads and other portable devices as second or even third screens," said Peter Skinner, founder of Ten One Design. "Even if it's just for watching Stranger Things. We don't judge." The Mountie+ can be pre-ordered from the Ten One Design website for $34.95. It will begin shipping out in December. Actually, mounting your phone to the top of the screen makes a lot of sense and might not be too heavy. But what’s the prefered software strategy for using an iPad as a second screen these days? My first thought was, "Well, that extra weight can't be good for the hinge..."
This sounds like a terrible idea for the hinge. It opens up an entirely new market for hinge enhancers. Soooooooo, can someone explain to me why you wouldn't just buy 1 or 2 monitors instead of this monstrosity? I guess it might make sense if you're on the move with both the iPad and the MacBook. The monitors aren't portable. But at home or at the office I agree that a monitor makes a lot more sense! Have you seen Astropad ('https://astropad.com/')? You can even use Mac apps on your iPad.